What is the Sunset Run for Refugees? The Sunset Run for Refugees is a special running event on the evening of Wednesday, June 20th, World Refugee Day, involving running and fitness clubs from throughout Washington DC that will culminate in a candlelight display and vigil at the Lincoln Memorial Reflecting Pool. With candles in hand, we will form a “caravan of light and hope” and embark on a short run or walk as the sun sets on the horizon. Our journey concludes at the Lincoln Memorial Reflecting Pool, where our symbolic caravan of light and hope for refugees will come togehter for a massive candlelight vigil in support of refugees around the globe as the sun sets in our Nation's Capital. We aim to emanate light and hope out into the world on World Refugee Day. The basic concept for this event is very simple. We’re inviting running and fitness clubs, and all other interested individuals, to head out in the evening for a run at about 40 minutes before sunset (around 8:00 pm) on June 20th, rain or shine. All runners will receive plastic LED candles. 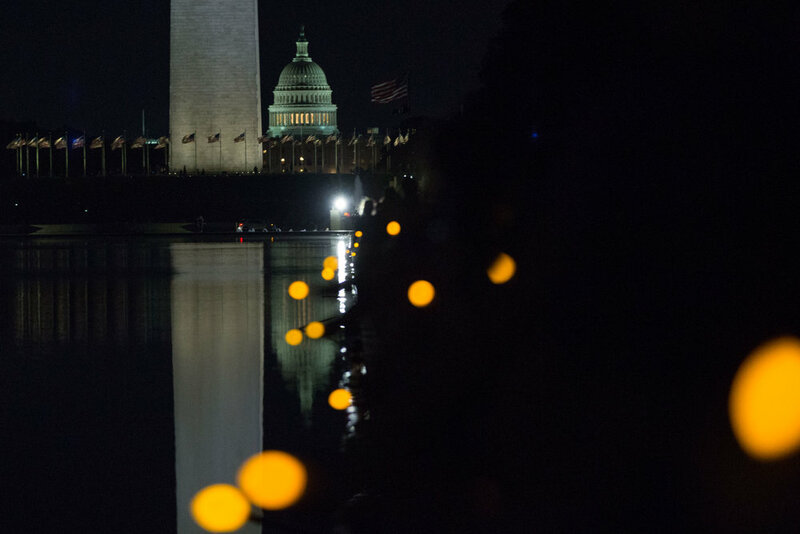 Around sunset (8:40 pm), all running groups will arrive at the Lincoln Memorial and then proceed to form into a single-file “caravan of light and hope” that will surround the reflecting pool for a candlelight vigil in support of refugees. The entire vigil should last no more than 20 minutes, and there will be photographers and videographers on hand to capture the display. Our goal is to get 1,000 runners out to the event so that we can completely envelop the iconic Lincoln Memorial Reflecting Pool, whose beautiful vista is instantly recognized across the globe. The Lincoln Memorial Reflecting Pool is also an appropriate setting as it has been center stage for some of the greatest assemblies of humankind gathering the name of love and humanity. Through this event, we aim to radiate light and hope into the world from the nation’s capital on World Refugee Day. This event will also raise money for four refugee relief organizations -- American Refugee Committee, Care International, Save the Children, and International Rescue Committee. There is no ticket or entry fee needed for the Sunset Run for Refugees, but registration through Eventbrite is strongly encouraged. Additionally, please RSVP on our Facebook event and encourage others to do so, too! We are proud to begin our journey at the the George Washington University’s Elliott School of International Affairs (1957 E Street NW), located just blocks from the Lincoln Memorial Reflecting Pool. Doors open for check-in at GW’s Elliott School at 7:00 pm. All runners will depart Elliott School (in small groups of 20-40) by 8:00 pm. Event participants should arrive to Elliott School no later than 8:00 pm. Elliott School is within a short walking distance of the Farragut West and Foggy Bottom-GWU Metro stations on the Orange and Blue Lines. Who is a part of this event? And how can I become part of this effort? The Sunset Run for Refugees is intended as a fully collaborative effort of the entire running and fitness community in DC. This is an act of love that should show the very best that the DC running and fitness community has to offer as we all come together to do something impactful on World Refugee Day. As such, each participating running and fitness club is an equal partner in this effort and encouraged to bring their own unique identity and creative ideas to help make this event something truly beautiful and special. If your club or fitness community would like to join in this effort as an event partner, or if you'd like to volunteer, please contact us here. We also welcome any organizations and businesses that are interested in sponsoring the event. Please check out our sponsor page to see a list of current sponsors. Please reach out to us at dcrunforrefugees@gmail.com or via our contact form for more information or to become a sponsor. Will the Sunset Run for Refugees help raise money for charity? Our goal is to raise at least $10,000 in charitable contributions for these worthy organizations. All donations will be processed electronically and provided directly to the charities through the nonprofit payment network provided by Act Blue. Please note that cash donations will not be accepted. All donations are tax deductible. Yes, absolutely. There will be a 2-mile route for walkers. Families (and strollers!) are more than welcome to join us as well. We will accommodate anyone who would like to partake in this important event in support of refugees. Is there a bag check? Yes, a free bag check will be provided at the Elliot School of International Affairs. This event is being organized at no cost to participants. One goal of the Sunset Run for Refugees is to raise funds for refugee relief efforts around the globe, so we encourage all event attendees to make a donation to benefit our charity partners in place of any registration fee. Please donate to our wonderful causes using the "DONATE NOW" link above. If you do wish to contribute to the event to help cover event expenses such as electronic candles, printing costs, and facilities fees, consider donating to our crowdfunding campaign here. If you are interested in becoming an official event sponsor, please contact us. What is World Refugee Day? Established by Resolution of the United Nations General Assembly in 2000 and occurring each year on June 20th, World Refugee Day is an international observance intended to call attention to the plight of refugees and individuals displaced from their homes due to war, violence, and persecution. The first World Refugee Day was observed in 2001, coinciding with the 50-year anniversary of the 1951 Convention relating to the Status of Refugees. Each year on June 20th, there are numerous events around the globe designed to raise awareness of the tremendous struggles refugees face and urge action toward solutions. Learn more about World Refugee Day here. All images on this page courtesy of Ellie Van Houtte.